Foam and padding are essential for upholstering cushions and chair seats. Foam can be formulated for indoor or outdoor use, comes in both high and medium density, a multitude of sizes, and various grades ranging from automotive and marine to acoustic foam for soundproofing. Check out our selection of foam & padding here. We used foam and padding to reupholster a dining chair, make an upholstered spool ottoman, and to make a box cushion. We offer a large selection of both high and medium density foam. The difference between the two is not the firmness, but the durability. 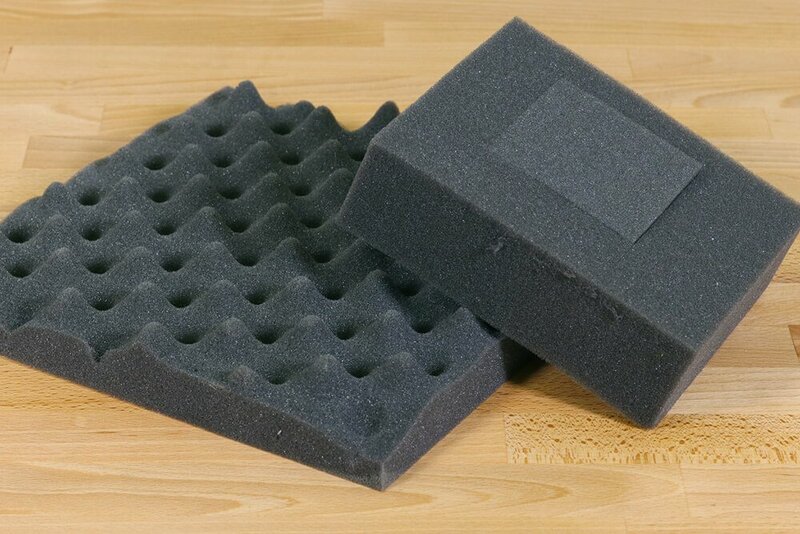 Both high and medium density foam feel the same when you sit or press on them, but high density foam will last longer. Our high density foam has a density of about 2.5 pounds per cubic foot, compared to a density of about 1.8 pounds for medium density foam. For applications that get heavy use, like dining chairs and mattress tops, we recommend using high density foam. Medium density foam is sufficient for projects that only get light or occasional use like accent chairs and headboards. Most foam is rectangular, but we also offer wedge foam and cylindrical bolster foam. Padding is often used in conjunction with upholstery foam to round out edges and corners and provide more fullness. Many chair cushions and couches use padding along with foam, but the padding doesn’t offer enough support to use on its own. Use a spray adhesive to attach the padding to the foam. Rebond foam is a super firm and durable foam made of recycled shredded scrap foam. This is a dense, open cell foam that provides a solid support base and holds its shape well. Rebond foam is often used for bar stools and motorcycle seats. Click here to learn more about rebond foam. For outdoor applications you’ll want to use foam that was made for outdoor use. Eva-Dri and EZ-Dri foam are medium density products designed to let water flow through them rather than absorbing it like a sponge. The open cell construction allows for quick evaporation of humidity and moisture. These foams are very similar, but EZ-Dri foam also has a fungicidal additive that inhibits growth of fungus and mildew, preventing stains and bad odors. This makes it a popular choice for marine applications like boat cushions. We also offer outdoor cushions made of either 100% polyester or densified polyester batting. For automotive applications, we have polyester carpet padding as well as different widths of cloth backed sew foam. 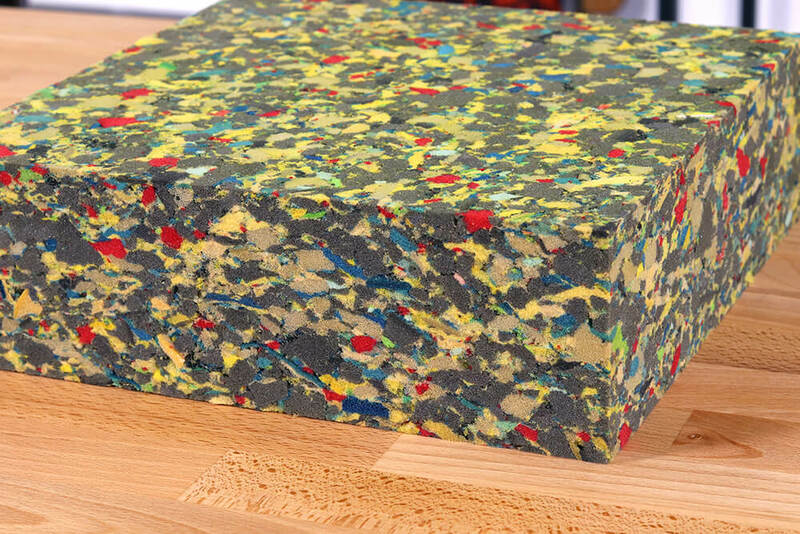 In addition to carpeting for automobiles, this 100% recycled polyester padding is great for vibration proofing and sound dampening. This is a 20 ounce padding that’s about 0.2 inches thick. Cloth backed sew foam is a firm polyurethane foam with a cloth backing. This versatile foam is popular for car headliners as well as boat upholstery and costume padding. This foam is easy to cut, and the backing makes sewing or gluing a cinch. Keep in mind that the color and exact density and makeup of the foam may vary. 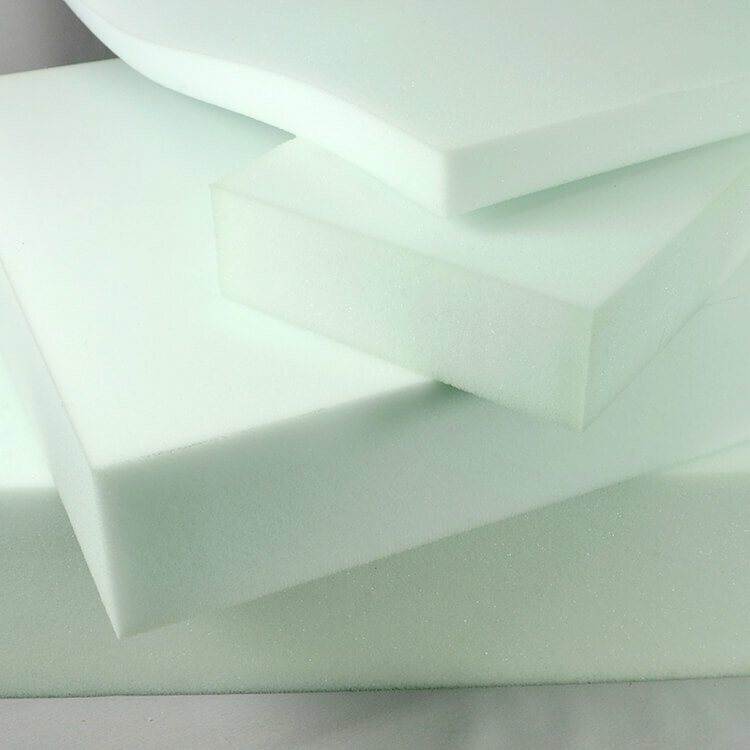 Our specialty foam selections include mattress foam of medium and high densities, memory foam mattress toppers, acoustic foam, closed cell foam, eco-friendly foam, egg crate foam, packing foam, pick & pluck foam, and rubberized upholstery hair. Acoustic foam is used for sound dampening by attaching it to walls and ceilings. The foam essentially dissipates the energy of sound waves into heat. The purpose is to reduce sound resonance, not completely eliminate it. Our acoustic foam is flame retardant, and has a density of 1.85 pounds per cubic foot. Closed cell foam is a durable, buoyant foam used for boat seats, exercise mats, insulation, and more. The difference between this foam and open cell foams is that the cells aren’t open to the air or the other cells. Because of this, closed cell foam is stiffer and heavier than open cell foam. Soy foam is an eco-friendly product that uses renewable raw material alongside traditional petrochemicals. The manufacturing process requires about 60% less non-renewable energy compared to the manufacturing of traditional foam. With a compression strength (ILD) of 27 pounds and a 2.5 pound density, soy foam is considered a high density upholstery foam. Egg crate foam is a medium density foam often used for mattress toppers. Upholstery hair is a rubberized “hair” product with a plastic screen backing. This upholstery hair is easy to cut with scissors or a knife, and is often used for insulation and upholstery fill in antique furniture as an alternative to horse hair padding. Though it is mildew resistant, outdoor use is not recommended. Packing foam is an open cell medium density foam made specifically for protection in boxes and cases for instruments, cameras, and any other equipment that needs protection. Another foam made for packaging is pick & pluck foam. This foam is a little less dense than packaging foam. Pick & pluck foam is partially cut into small cubes that can be ripped out by hand to form the perfect shape for whatever you’re protecting. Foam is typically shipped in a tightly wound roll. The foam will need to be unrolled and allowed time to expand to its correct thickness, this can take up to 24 hours. Once the foam is exposed to air, it will start to turn yellow. This is normal so no need to be concerned when the color changes. Cutting foam is easy with an electric or serrated knife. See our instructions on how to cut foam. 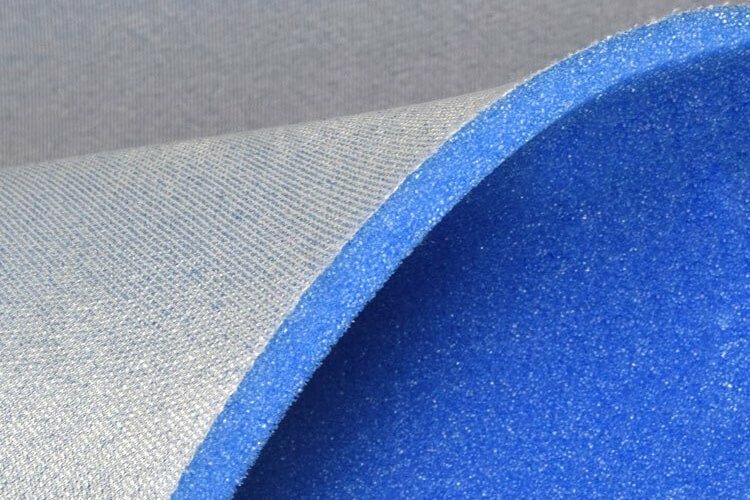 If you’re using padding with foam for an upholstery project you will likely need to use spray adhesive to attach the layers and prevent slipping. Check out our selection of foam & padding. What’s the best foam for dog beds? BEST ANSWER: We'd suggest either the EZ-Dri or EZ-Dri foam, especially if the cover isn't waterproof. what is the best foam for reupholstering indoor/outdoor round seating cushions? BEST ANSWER: We'd suggest the Eva-Dri or Ez-Dri outdoor foam. They can be cut into a round shape with a serrated or electric knife.